Llansantffraed Parish Church is in the Rural Deanery of Glyn Aeron, in the Diocese of St. Davids, and part of the Church of Wales. It has been listed by Cadw as a particularly important building of more than special interest which is why it was given a Grade 11* status. It stands within a conservation area that includes the old village of Llansantffraed and is some 350m from the sea. The church is dedicated to St Ffraed (Bride or Bridget in English c 450 - c 525) who was renowned for her acts of mercy and pity for the poor. She is reputed to he the patron saint of those engaged in dairy work and in the south wall stained glass window she is depicted holding a bowl of milk. After Patrick she is Ireland’s Patron Saint. She lived and founded a nunnery in Kildare the first erected in Ireland. The adoption of an Irish saint is probably due to the maritime links with Ireland that were possible through ship building along the Cardiganshire coast. Some of these ships were built here in the village of Llansantffraed. Trade and religion linked much of Wales to Ireland. Indeed, the Welsh church had strong Celtic origins before its later affiliation with Rome. 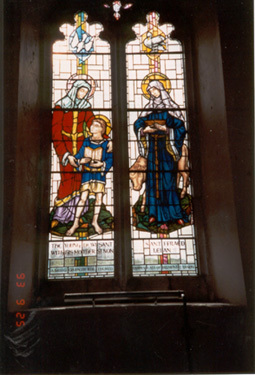 The other half of the same window depicts St Non, and her young son Dewi Sant (St David), who is reputed to have been born in Llanon. It is from here he is said to have walked 6 miles daily to school at Henfynyw (Old Menevia). The window dedicated in 1972, commemorates the rare phenomenon of two female saints within one parish. The east window depicts the risen Christ and was dedicated in 1975. It is somewhat unusual because it depicts the Resurrection whereas most other east windows show scenes from the Crucifixion. This seeks to convey the wonder of the Easter message to those who come here to worship. The remains of an old chapel, commemorating St Non, are thought to be in the village. The ruins, which can be found to the rear of the old Post Office, are claimed to be that of a Chapel-of-Ease. Further recent investigation however suggests that these were the ruins of a domestic house and it seems more likely that the Non Church stood on the site of a nearby house called Homerton, which was built on the site in 1902. This, like Llansantffraed, Church, would originally have been a monastically based Celtic worshipping cell. 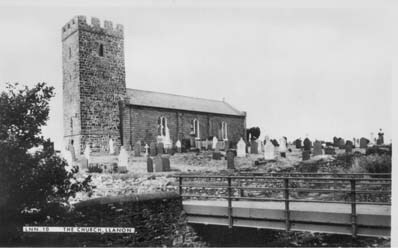 It ceased to flourish after medieval times, although it was affiliated to Llansantffraed Church as late as the beginning of the eighteenth century. The mounted stoop stone in the church porch was brought there, from the site of St Non’s Chapel some 40 years ago. The internal architecture of Llansantffraed Church, designed in the 1840s, features the unusual salem-like pattern more often seen within non-conformist chapels. 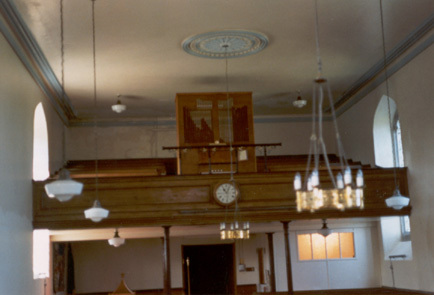 Typical of this type of architecture are the plastered ceiling, the tall door-opening pews. and the gallery. To the left of the altar is a wall plaque that pays tribute to the Revd William Herbert, the long-serving Vicar from 1836-1884.William Herbert followed his illustrious father, the Revd David Herbert 1797-1835 (1797-1812 as curate-in-charge). The pulpit commemorates another lengthy ministry, that of the Revd David Lewis, 1888-1917. A document in the National Library records that a John James, presumably a bailiff had served notice of ejactment on the vicar and the congregation at Llansantffraed Church immediately after divine service on 8th August 1742 by publically laying the Declaration of Ejactment on the Alter of the Chancel. No further information on the outcome is available so far, but there must have been some surprised parishioners going home afterwards. The stone font, peculiarly decorated, is probably the oldest object in the Church and is considered by Cadw to be 12th.or 13th. century. There is a medieval bell frame in the tower that is possibly the oldest in Cardiganshire. A Victorian bell frame has been superimposed upon it. The original frame was designed to hold three bells, and there is evidence that it contained that number at some time. Rope holes for three bells, with portions of the oak worn away by the action of the ropes are visible. These, and many other features, testify to the love of the parishioners for the Church. Historically, the Church probably spans at least 1300 years, incorporating the life histories of anything from four to six successively erected buildings on the site. The final church rebuilding of 1838-40 required the total refurbishment of the walls, except for the tower which is generally thought to date from the 14th. Century. The tower was restored in 1994 to what would have been its original state, the mortar mix being of the same kind. The unusual south wall slate cladding provides protection against the prevailing sou’westerly gales that sweep across the flat slangs of Morfa Esgob and which originate out in the Atlantic Ocean . This slate cladding can he seen elsewhere in the area - on houses and other buildings. This too was renewed in 1994. 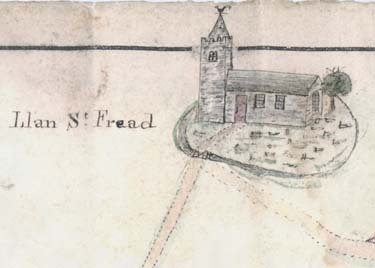 The pre-1838 church, from Meyrickc’s witness of 1808. bore traces of a chancel screen, possibly built at the samc time as the tower, any time from late Norman to early Tudor period. Restoration work on the bell-tower in 2002 has revealed the head-beam of the former rood-screen which had been cut in half and reused as ceiling beams in the porch. The carved frieze of alternate fan-leaf scallops and dentilled features can now be viewed by visitors to the church as one of the beams has been left uncovered when the new ceiling was constructed. Drawing of the rood screen beam which can be seen in the church porch . In past times Llansantffraed was home to a ship building yards. From here generation after generation of local men became mariners. A trip around the gravestones will bear witness to this. Some mariners and ships traded as far as South America. Some 55 vessels were constructed in the parish between 1786 and 1864. One gravestone is that of Henry Harris. the parish’s last and most successful shipbuilder. Inscribed into the flat, vaulted gravestones, to the north side of the church door, are the rough but clear outline of those sturdy built bygone vessels. Three of the oldest gravestones are affixed to the east and south exterior walls. To the south of the door are the enclosed marbled gravestones of the eminent David Morgan (1814-1882) and his family from Alltlwyd. A diligent churchwarden. Morgan was the last operator of the local Craiglas Lime Kilns which can he found along the coast towards Llanrhystud and also the last and probably the only brewer who operated from what is now called Plas Morfa. Leading up to the door, from the gates, is a finely set pebble pathway that rernains about the best example of what would have been once extensive pathways. Others can be found around the village, outside houses and even in interior hearths. There are documents relating to the Church from the 1200s. A list of successive vicars is fairly complete from 1546 onwards. Parish registers date from 1754, and vestry minutes from 1819 just after the Napoleonic wars. During the Commonwealth years the building was, reputedly, desecrated by Cromwell’s soldiers, and the prominent tower offered a tempting target for sailors to shoot at. A cannon ball from a small ship’s canon. found in the graveyard, is stored in the church safe. Before 1900 most villagers lived within the confines of two small rivers, the Peris, and the Cledan. They were partly supported. economically, by the cultivation of the 300 plus ‘slangs’ in this area, called Morfa Esgob (Bishops meadows. Legend ascribes them as St David’s gift to the villagers around 1231. This communal system of cultivation is rare and Celtic in essence. Coastal erosion means the church, set 41 feet above sea level, stands closer to the waves than ever before But it continues to stand as a witness to the Gospel in the name or St Ffraed. and still defies the coastal elements and the passage of time. To honour Ffraed and worship God. With massive tower of noble height. And Cantref Gwaelod lies asleep. And a promise of a life to be. Choose you heaven or choose you hell. 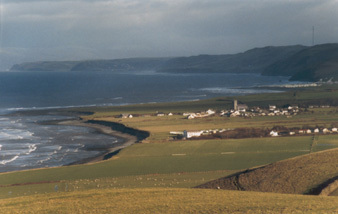 Llanddeiniol. Rev.John Timothy Lewis, 1879-1971.